Wall tapestries from Ambesonne will be high-quality decorative elements for your home decoration. 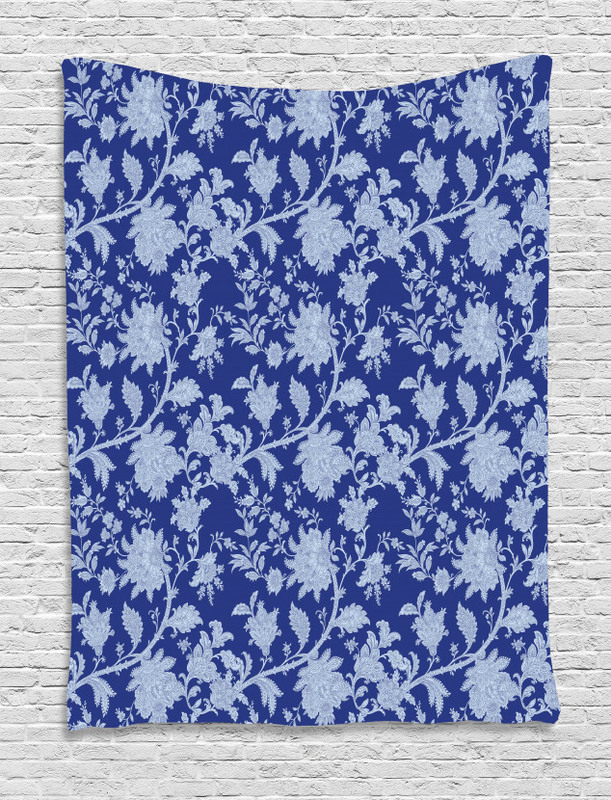 Floral themed Paisley Pattern Ottoman Tapestry will provide a creative and original look into the room with its unique Royal Blue color. With many size options from 60x80 to 40x60, to buy Paisley Pattern Ottoman Tapestry will be the first step to make a dramatic change in your interior design. You will be impressed by the brilliant atmosphere created by this Floral wall tapestry. Printed with the highest technology, wall hangings and wall blankets on Ambesonne.com offer premium qualities with affordable prices. Shop now your favorite design from Floral tapestries with only $34.90 and free shipping. Soft and lightweight Ambesonne tapestry wall hangings will fill your empty walls with style and fun. Ambesonne designs wall tapestries for your bedroom and living room with high quality and classy products. Using our lovely digital printed patterns will give your place more contemporary look than a tapestry needle does. To change your room's aura is now so easy with Ambesonne tapestry. I was eyeing for a month before I finally decided to buy it and I am so glad that I did that. I have a separate kitchen and a bedroom so I got multiple tapestries. One of them is hung at bedroom and the other one now has a ribbon and it is on the window. During the day it looks amazing. Great quality and people who see it loved it. The most and only disappointing thing about this is the fact that it comes with creases that I had to iron out. I did not pressed it but I would suggest doing so. Other than this quality is really nice and it is a very useful item. I would place this in anywhere in my home. I adore this tapestry. I bought two other similar tapestry but this was by far the best one. Quality of picture, material and colors are top notch. I am still trying to get the wrinkles out though. I hung it in my workspace with lights so when I work I have a magical place to hide. I wish to visit the real place one day. I have a skater and a gamer grandson he loves this tapestry in his room. Over the computer. On top of that the product is nice quality. I am very pleased with it and love the feel of it. Well worth the money we gave. Definitely recommend the product. I was searching a tapestry like this for a while on various sites but this one was the best fit for me. It adds so much color as well as character into my living room. I love everything about it!!! It has a magical aura to it and it really looks nice. Adding this much color to your living room can be hard but it really pulls it off. I thought that hanging was going to be a bit of challenge but I have managed to put it on the wall with pins without much challenge. When it was perfectly aligned it looked incredible.